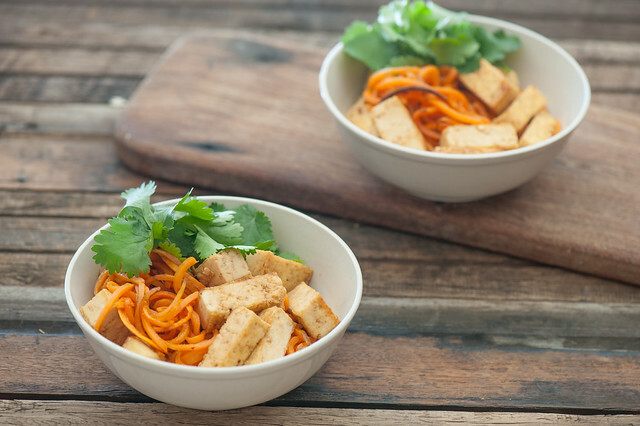 Honey & Soy Tofu with Sweet Potato ‘Noodles’ recipe HERE. If anyone were to ask me what’s my biggest struggle with food and cooking at the moment, I have a very clear answer. Getting small boys to eat vegetables. And while we’re very much still on a journey, there’s one piece of advice my friend Elizabeth shared that’s really helped take the stress out of family meal times. As a parent it’s our job to put age appropriate food on the table at appropriate times. As a child it’s their job to decide what they eat. And how much. Since embracing this philosophy, it’s made meal times soo much easier. I no longer feel responsible for getting the boys to eat anything. I can’t tell you how this simple change in mindset takes the pressure off all of us. Sure there are some days where I worry that they’re going to starve. Or get seriously malnourished. If you’d like to go deeper with this, I recommend checking out the book ‘How to Get Your Kid to Eat (but not too much)‘ by Ellyn Sutter. It covers different ages and stages but the essential philosophy is the same as what I’ve shared here. So don’t feel like you need to read the book to try it out. Are family meal times less than ideal in your house? Or are you going to make me jealous with your little broccoli lover? I’d love to hear about it in the comments below. My older Sun love vegetables and would beg for a bunch of broccoli to dip in a tangy dressing after school . So I thought all kids would be that way … and then I had my second son who hated all vegetables. In fact the only vegetable he ate was french fries, and when he discovered they were a vegetable he accused me of lying to him and stopped eating them too!!! Thankfully today he loves as many vegetables as his older brother does. But it took years!!!!!! Isn’t it amazing how different they can be Karen! So glad to hear you got there in the end… gives me hope! I love this idea. I am always stressed about my daughter eating enough, but offering choices all the time we she turns her nose up st what I’ve cooked is just setting up bad habits. Will have to try and embrace this philosophy of it being her choice how much she eats! It’s always stressful with small kids and veges. Early on, I insisted they tried new foods. They didn’t have to like them, but they had to try them. Later, when they were a wee bit older, I came up with a plan that has worked brilliantly for us. They’re allowed 5 things they don’t have to eat. Just 5. Anything else, they have to eat. That allows them their preferences and doesn’t mean they sit gagging through food like I had to, but means I don’t have fussy eaters. They have fully bought into it and even make their friends do it when they are at our house! Thanks for sharing what works for you Monique! Don’t have kids, never did. But even before I got anywhere near the variations, I was thinking this would be a great meal for adults. I would probably serve it with some steamed broccoli… or perhaps roasted Brussels sprouts… or even mix in some kohlrabi noodles. It looks quite healthy and tasty!!!! I’ll definitely try to make this, Thanks for sharing. I have three kids: a thirteen year old boy, a eight year old boy, and a seven year old girl. All three will eat foods other children won’t even touch. The younger two’s school principal even commented on the fact that they eat everything in their lunches and everything in their lunches is very healthy (especially when compared to our American cafeteria lunches). The best clues I have in how we were able to teach them to enjoy healthy foods is that we never served them anything different from us, the adults, so they always saw that we ate and enjoyed the food. Also we always told them they were welcome not to eat but that there would be no other options if they didn’t finish what was in front of them. It was important to keep their portions for new foods small so new flavors were introduced in sizes less daunting to finish. Our thirteen year old gobbles up nearly everything. Lucky you Rachel! I agree not offering alternatives is key and keeping their meals the same as yours can be helpful. But there is some personal preference part to it as well I’m sure.